Few people today realize that British and American soldiers fought in a battle that compares to Stalingrad for human suffering. 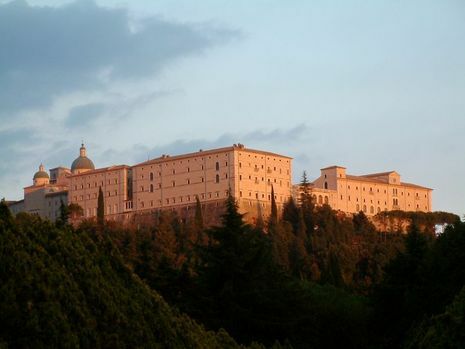 The Battle of Monte Cassino was a mini-war within World War II. It was Europe’s largest land battle and was fought over six months with over 300,000 casualties. The third battle began March 15. After a bombardment of 750 tons of 1,000-pound bombs with delayed action fuses, starting at 08:30 and lasting three and a half hours, the New Zealanders advanced behind a creeping artillery barrage from 746 artillery pieces. Success depended on taking advantage of the paralysing effect of the bombing. However, the defences rallied more quickly than expected, and the Allied armour was held up by bomb craters. Nevertheless success was there for the New Zealanders' taking, but by the time a follow-up assault on the left had been ordered that evening it was too late: defenses had reorganised, and more critically, the rain, contrary to forecast, had started again. Torrents of rain flooded bomb craters, turned rubble into a morass and blotted out communications, the radio sets being incapable of surviving the constant immersion. The dark rain clouds also blotted out the moonlight, hindering the task of clearing routes through the ruins. On the right, the New Zealanders had captured Castle Hill and point 165, and as planned, elements of Indian 4th Infantry Division, now commanded by Major-General Alexander Galloway, had passed through to attack point 236 and thence to point 435, Hangman's Hill. In the confusion of the height, a company of the 1/9th Gurkha Rifles had taken a track avoiding point 236 and captured point 435 whilst the assault on point 236 by the 1/6th Rajputana Rifles had been beaten off. By the end of March 17 the Gurkhas held Hangman's Hill (point 435), 250 yards (230 m) from the monastery, in battalion strength (although their lines of supply were compromised by the German positions at point 236 and in the northern part of the town), and whilst the town was still fiercely defended, New Zealand units and armour had got through the bottleneck and captured the station. However, the Germans were still able to reinforce their troops in the town and were proving adept at slipping snipers back into parts of the town that had supposedly been cleared. 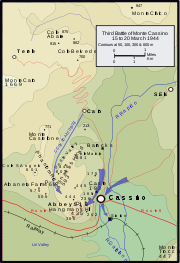 March 19 was planned for the decisive blow in the town and on the monastery, including a surprise attack by tanks of 20th Armoured Brigade working their way along the track from Cairo to Albaneta Farm (which had been prepared by engineer units under the cover of darkness) and from there towards the Abbey. However, a surprise and fiercely pressed counter attack from the monastery on Castle Hill by the German 1st Parachute Division completely disrupted any possibility of an assault on the monastery from the Castle and Hangman's Hill whilst the tanks, lacking infantry support, were all knocked out by mid-afternoon. In the town the attackers made little progress, and overall the initiative was passing to the Germans whose positions close to Castle Hill, which was the gateway to the position on Monastery Hill, crippled any prospects of early success. 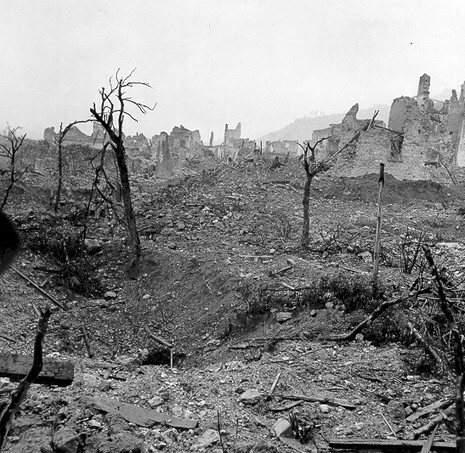 On 20 March Freyberg committed elements of 78th Infantry Division to the battle; firstly to provide a greater troop presence in the town so that cleared areas would not be reinfiltrated by the Germans, and secondly to reinforce Castle Hill to allow troops to be released to close off the two routes between Castle Hill and Points 175 and 165 being used by the Germans to reinforce the defenders in the town. The Allied commanders felt they were on the brink of success as grim fighting continued through 21 March. However, the defenders were resolute and the attack on Point 445 to block the German reinforcement route had narrowly failed whilst in the town Allied gains were measured only house by house. On 23 March Alexander met with his commanders. A range of opinions were expressed as to the possibility of victory but it was evident that the New Zealand and Indian Divisions were exhausted, nearing the end of their tether. Freyberg was convinced that the battle could not be kept going and he called off the attack. The German 1st Parachute Division, some weeks later described by General Alexander, the Italian theatre commander, in a conversation with General Kippenberger as "...the best Division in the German Army...", had taken a mauling, but it had won.